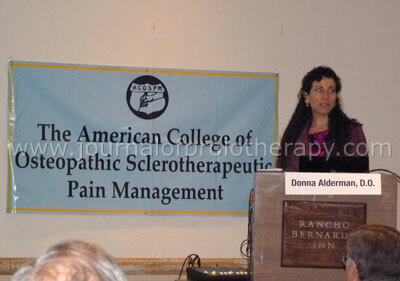 The annual teaching conference of the American College of Osteopathic Sclerotheraputic Pain Management (ACOSPM) was held April 8-11 at the beautiful Rancho Bernardo Inn facility in San Diego. As always, this was a very valuable training and education experience. Entitled “Prolotherapy, a Comprehensive Approach,” the conference focused on teaching basic and advanced Prolotherapy techniques, and in addition featured introductory lectures on Mesotherapy, Neural Therapy, Therapeutic Nutrition, Manual Medicine (musculoskeletal manipulation), Hormone-Healing interactions, and other topics which augment and enhance the effects of Prolotherapy treatment. Program Chairwoman Aline Fournier, DO assembled a stellar cast of teachers and mentors. The conference room at the San Bernardo facility. Prolotherapy is a medical technique developed in the 1930s using various “proliferant solutions” to trigger the body’s strongest connective tissue healing response. One of the fathers of this field was Earl Gedney, DO. This organization carries forward his legacy, while disseminating current research and clinical information in this rapidlygrowing field. As aptly stated by Dr. Damon Whitfield, “All connective tissue healing is incomplete. Prolotherapy picks up where the body’s natural biochemical processes leave off.” This technique has wide application in treating various types of joint damage and a wide array of other connective tissue problems. Some of the attendees have practiced this technique for over 30 years, with great success. Approximately one third of the 150 attendees had never employed this treatment and were seeking basic training. In his opening lecture, ACOSPM President Walter Grote, DO posed the question, “Where, and how, do you start using this treatment?” For this portion of the audience, the essentials were conveyed over the next three days. Ways to identify and evaluate candidates for Prolotherapy were taught. Different proliferant solutions and their utility were discussed. Techniques for treating each major joint and region were taught in lecture, and then illustrated in lab courses. New this year was video feed of treatments to large screens in the lab areas, so that everyone had an unobstructed view of even the best-attended demonstrations. Attendees who desired treatment for various problems provided a large and varied array of treatment demonstrations for the rest. Damon Whitfield, DO, lectured on treatment of non-enthesis soft tissue damage, including muscle and fascial injuries, then demonstrated techniques in the lab session. Prolotherapy is a remarkably safe treatment modality. The principles which result in such a low complication rate were stressed, as well as identifying and managing those complications which are occasionally seen. One area of particular interest was a discussion of the interaction of chondrocytes and various local anesthetics. High dose administration of bupivicaine has produced cartilage damage in some settings. There has been concern voiced in some quarters that intra-articular Prolotherapy using bupivicaine, and possibly other local anesthetics, might cause a similar complication. Evidence was presented that cartilage damage is both agent and concentration dependent. Lidocaine above 0.25%, and bupivicaine above 0.125% should be avoided, but below these concentrations no chondrocyte toxicity is noted. Ropivicaine demonstrates no such toxicity. Chris Davis, DO, next year’s Program Chairman, mixing proliferant. More experienced practitioners were greeted with a wealth of opportunities to sharpen and enhance their skills. All of the “basics” lectures were laced with pearls and comments on advanced techniques. There were lectures on use of ultrasound for diagnosis and for targeting of treatment by John Kripsak, DO, on the use of Platelet Rich Plasma and Mesenchymal Stem Cells by Donna Alderman, DO, and on Prolotherapy of non-enthesis connective tissue injuries (e.g. herniae and other fascial injuries, muscle injuries, etc.) by Damon Whitfield, DO. Dr. John Sessions taught and demonstrated techniques of venous Sclerotherapy. As always, some of the most valuable educational experiences were the informal discussions that took place during the delightful breakfasts and lunches provided for attendees. Charles Nowacek, MD, Orthopedic Surgeon from Hastings, NE., and wife Linda Nowacek discussed the importance of this meeting. Techniques that can be used alongside Prolotherapy for treatment of more complex pain syndromes were also covered in detail. 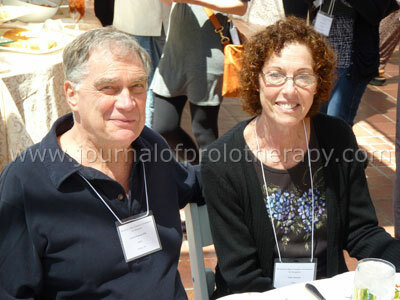 These included Neural Therapy, taught by Gerald Harris, DO and Mesotherapy, taught by Aline Fournier, DO. Both lecturers highlighted the potential of these modalities to treat dysfunction of the autonomic nervous system, which is often an unrecognized component of post-injury pain, and both illustrated in lecture and clinical demonstration how to identify and treat these disorders. Several lecturers detailed the interaction between nutrition and healing, and advocated various clinical approaches to promote connective tissue healing and overall health. Dr. Richard Hull, past President and new Vice President of the ACOSPM, demonstrating evaluation and treatment. This conference is designed to introduce physicians to Prolotherapy, to equip them to begin offering this treatment, and to enhance the skills of Prolotherapists at every level. How well does it meet these objectives? 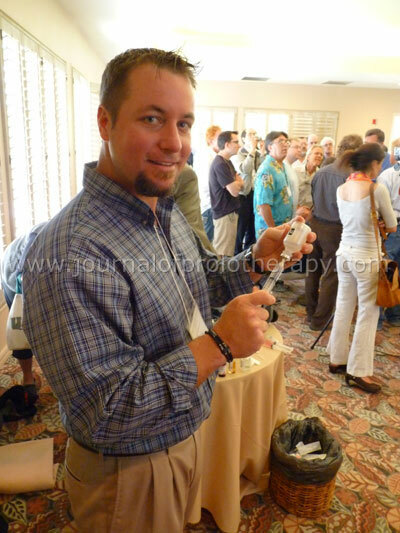 Robert Vance, DO of Las Vegas, Nevada obtained his first Prolotherapy training at the ACOSPM seminar a year ago. Since this initial exposure, he has performed about fifty treatments. His success rate for treatment is around 75%, and he cited several patients who had experienced life-altering results. He was particularly excited about a 79 year-old patient with low back pain who was on high dose narcotics and using a walker last year. This year she is off narcotics and her mobility is dramatically improved. The patient is understandably delighted. Dr. Vance is back for more training. He highly recommends this experience for anyone wanting to learn this technique. Donna Alderman, DO, ACOSPM Board Member and on the Editorial Board of the JOP, delivering a lecture on Platelet Rich Plasma and Mesenchymal Stem Cells. As one of the few, and as the oldest (originated in the 1930s as at the American Osteopathic Society of Herniologists, and reorganized in 1956 as the American Osteopathic College of Sclerotherapy, the current organization name was adopted in 1996.) 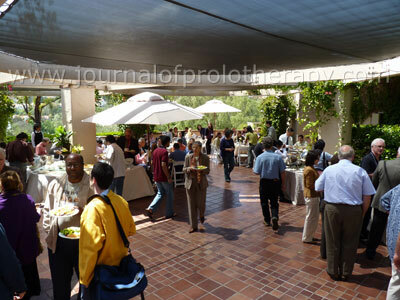 organization for practitioners of Prolotherapy and related disciplines, the ACOSPM is dedicated to preserving and promulgating the considerable experience and wisdom of its members, many of whom have offered Prolotherapy treatment for decades, and many of whom were close friends and associates of the “fathers” of this discipline. Although under the aegis of the American Osteopathic Association, there are a number of MD’s among the membership—including this author. Outstanding breakfast and luncheon buffets offered participants a chance to ask in-depth questions and to discuss all aspects of Prolotherapy with experienced practitioners. The last picture shows Dr. Mark Johnson of Brentwood, TN. (on the editorial board of JOP) discussing Prolotherapy with Dr. Charles Nowacek of Hastings, NE. Three administrative issues of note were covered during this meeting. First, a new slate of officers was installed. 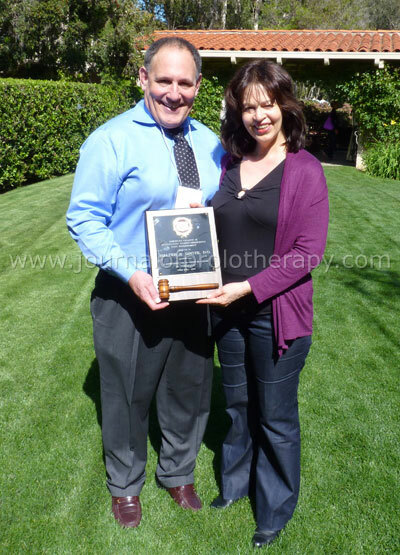 Dr. Walter Grote, of Columbia, New Jersey passed the President’s gavel to Dr. Aline Fournier, of Escondido, California. The new Vice President is Richard Hull, DO, recently retired to Cabo San Lucas, Mexico, and the Program Chair for next year is Dr. Chris Davis of Springfield, Pennsylvania. Secondly, application was made to the American Osteopathic Association to change the name of the organization to reflect its emphasis on Prolotherapy. The proposed name is the American Osteopathic Association of Prolotherapy Integrative Pain Management (AOAPIPM). Thirdly, Dr. Grote and others, notably Gerald Harris, DO, are continuing their efforts to develop a Residency/Fellowship program for Prolotherapy. Dr. Grote issued a challenge to the AOA governing body to become more helpful in this effort, which seems to have become stalled in the bureaucratic processes of the AOA. Appropriate credentialing, including residency and/or fellowship training, and board certification, seems to be a next essential step in moving this important treatment modality into “mainstream” medicine. Walter Grote, DO, presided over this meeting, then passed the President’s gavel to Aline Fournier, D.O. 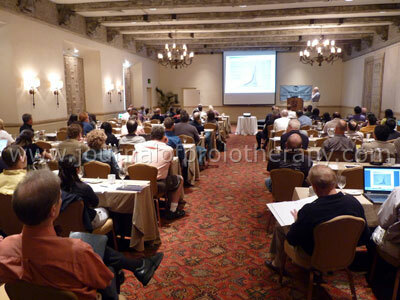 Next year this conference will be held in April 2011 in San Marco Island, Florida. For reservations for next year’s meeting, or to find out more about this organization, please contact Ms. Linda Pavina, the Executive Secretary of the ACOSPM at (800) 471-6114, or visit the website ACOSPM.com.